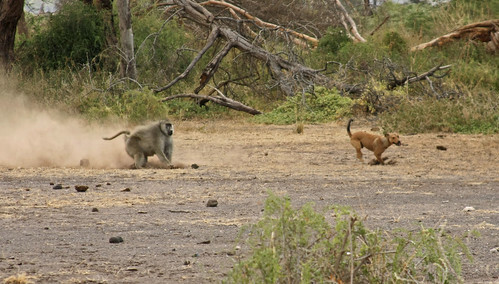 Baboons absolutely fear Maasai. If they see a single Maasai off in the distance, they start getting edgy until they feel they''ve braved it out long enough and then the whole group runs away. It seems like such an extreme response to the Maasai who don't seem to be any kind of threat to the baboons. I've asked about this and have always been told that it's because the baboons fear the Maasai dogs. Well, in all the time I've been here, I've never seen a Maasai dog ... until today. The baboons had an extreme reaction to the sight of four Maasai and went racing into a grove, crashing through bushes and scampering up trees. Everyone was giving alarm calls, many were screaming - and then I heard the barking. I saw the dog go running into the grove chasing the baboons and tried to follow. Then I got a glimps of the dog chasing one of the male baboons. I asked Longida if the dog could hurt any of the baboons (infants and juveniles were all screaming), and he said no, the males would chase the dog away. Sure enough, here comes Israel charging out of the grove running after the dog. He chased the dog who had no problem getting way. After he felt he had chased the dog far enough from the group, Israel stopped and turned around. Then the dog chased Israel, then Israel chased the dog. This went on a couple of times until the Maasai called their dog to come back. Everything ended fine, but it was very dramatic while it was happening. I've seen adult males threaten each other and chase after females, and I've seen some scuffles that look pretty serious, but I've never seen an adult male charge like this against a serious threat. Although I like dogs, I was proud of Israel and glad when the dog was gone and the group could relax and everything returned to being peaceful.